Valentine’s Day is one of the biggest and loveliest days for lovers. Infect we can say that it is the biggest holiday after Christmas and New Year eve for everyone. On this day everyone wants to give a superb gift to his/her lover or beloved ones. But choosing the gifts for someone special seems really difficult on that day so if you love handmade work and love crocheting then we have brought some amazing and gorgeous free crochet patterns for Valentine’s Day gifts ideas. These free crochet patterns are such lovely and quick to make even they can be crocheted in last minute. And of course, this idea will prove very budget friendly and money saving. So, make your gifts with your own hands instead of buying new from stores. This will be very lots fun to make and really enjoyable. As crocheting is not limited till sweaters or scarves infect there is no limit of crochet projects and items then why we leave this art on this Valentine’s Day? And also handmade gifts are always priceless because they show your sincerity and true love to your beloved ones. So, Find some suitable and easy free crochet patterns for valentine’s day gifts ideas and make this Valentin’s day more special and memorable. All of these patterns will prove very helpful for you when you are in hurry and under pressure. Because all of them are quick to make as well as gorgeous. From mug cozy to a teddy bear, from pillow to crochet mittens, handbags crochet hat and lots of Valentin’s day gifts ideas are available here with free crochet patterns. So, let’s have a look at the following list and draw some inspiration. I hope you will love all of them and love to try them out with your own hands. So now, there is no any excuse and time to waste, just pick up the crocheting hooks and show the magic of your hands by crocheting these lovely and priceless valentine’s day gifts ideas. If you want to crochet something different that must be cozy and soft as valentine’s day gifts then these fingerless gloves will be a perfect idea. These are so lovely and will be helpful when you need your fingers free. What about this lacy and romantic pillow to gift someone your special on this valentine’s day? This is superb and one of my most favorite crochet valentine’s day gifts ideas. You can also crochet it for your own bedroom or living room to increase the decor and beauty of those places. This is so lovely and stunning crochet pattern that is a perfect combination of contrasts colors. Two ovals of contrasting colors are folded in half with strategic slits and making a beautiful heart. You can create a basket by joining these little colorful hearts together as shown in the pattern. I assure your beloved one will really impress by this gift given by you. Crochet this 4 different types of the granny-style bag with your own hands and gift it to your most special friend. The color combination is according to valentine’s day but you can choose any other color and use it all the year around. Not any other gift can be the more adorable and better than this beautiful and cute valentine’s teddy. It will really melt the heart of everyone with its fuzziness and cuteness. Its bowtie is also a better way to grab the attention of others and make it more attractive. This is a little sweet hat with crochet hat pattern. It’s really adorable and perfect according to the chilly season. As like these items are long lasting so it will memorize to your beloved one all of your true and deep love for a long time. These pop hearts can also perfect valentine’s day gifts for your lover. You can keep them in your hands or add them to your home decor where they will memorize you the love of your beloved one. These delicate and lacy crochet heart patterns are amazing and will prove a perfect valentine’s day gift. You can crochet them in various colors and they can use as heart buntings or as coasters. If you are fond of planting and love to grow and have plants even on valentine’s day then this crochet valentine flower pot cover will really become the cause of your happiness. You can crochet it for your own as well as a valentine’s day gift for your most special friends. This will also perfect for mother day gift. These simple and quick to make ombre heart coasters can be used double way. One, you can use it as coasters and two, use them as hanging buntings. 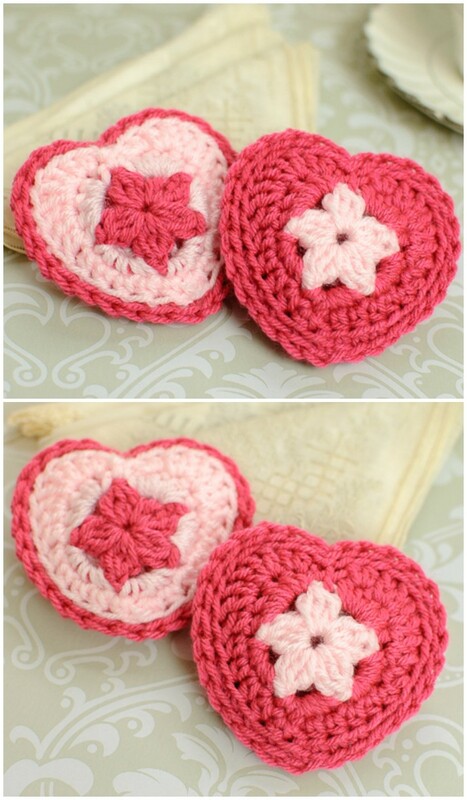 So crochet these little hearts on this valentine’s day for your own or for your beloved one. Mug coz is always proved a perfect gift for the winter season and when it comes to valentine’s day gifts then it also works perfectly with crochet heart pattern. So, crochet this cozy mug for your someone special and give him a way to remember you on daily base twice or thrice a day. These colorful heart motifs can be used individually as a dishcloth or you can make a blanket by joining them. It can also be a perfect valentine’s day gift. Make this beautiful, cute and easy to crochet buttons and hearts jar cozy and gift it to your beloved ones on this valentine’s day. You can also crochet it for your own to add a bit of decor to your home. What about this little adorable heart basket? This is really amazing and cute that will work perfectly for valentine’s day gifts. You can gift it as empty or fill it with some little presents. Make your home especially decorative for this valentine. Crochet this C2C valentine’s day table runner and enjoy the meal love and sincerity of your lover. It can also be a perfect and cute Valentine’s day gift. This is very simple, cute and easy to make crochet heart sachet patterns that you could make very quickly. These will also perfect valentine’s day gifts, just fill them with potpourri or essential oils. Make these little and sweet crochet hugs and kisses heart baskets and put them on your dressing table or gift them to your friends on this valentine. Crochet small roses in pink and red color and then combine them in the shape of a heart. It will become a roses heart wreath. Just hang it on your front door to say welcome to your beloved ones or gift it to them to let you remember for a long time.